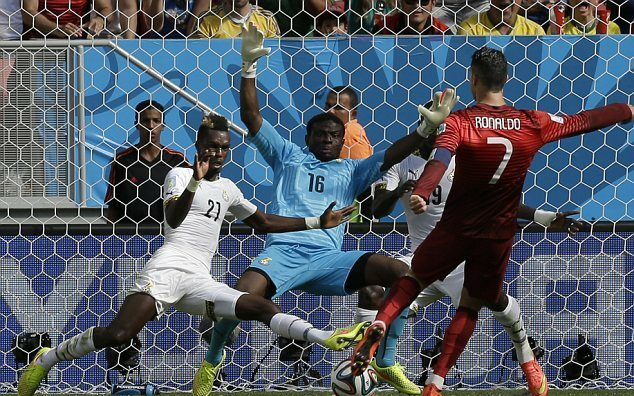 A match of Group G played between Portugal and Ghana on 26th was a thrilling effort from both the teams. Portugal who lost its first match and two players (Fabio Coentrao and Hugo Almeida) against Germany (4-0) made their way hard for this world cup. The team With -4 goal difference has to win the game with large margin against Ghana to be in competition. It was a tough call for Portugal to remain in challenge with all eyes on Real star player and ballon d‘Or winner Christiano Ronaldo. Ronaldo with all his stunning efforts fails to put any goal before half time. Portugal may get some relief after Ghana’s John Boye made an own goal(30′) before half time but it is then Ghana’s Gyan made an equalizer (57′) just after half time. The already stumbled Portugal tried its way hard to score against Ghana but fate has not favourized them. It was at 80th minute when Ronaldo made an easy strike against Ghana. Though Portugal with Ronaldo’s first strike of this world cup has got a 2-1 victory but fails to qualify for Last 16. I do agree with all the ideas you have offered for your post. They’re very convincing and can definitely work. Nonetheless, the posts are too short for starters. May you please extend them a little from next time? Thank you for the post. Hey there. I am Andy and I’m interested about that website. I’m totally freak and I love studying it everyday. I don’t annoyed. I simply like it. Thanks a lot!